After two years of growing my hair from shoulder-length until past my waist, of struggling with applying shampoo and conditioner, and buying sachets and sachets of those things, bearing pains in my arms as I tried to get all of it in one thick braid that would rival Rapunzel's, tying it up in a sock bun fashion (but without the sock), being unable to take off all the snarls and tangles, it is off! I have cut my hair, like Mulan did, but I didn't do it for China or to save my father. 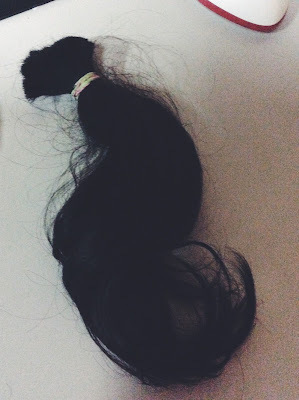 I did cut it for a cause--shedding a good 14 inches (longer, if you straighten it) and donating it to Papemelroti--who will make it into wigs to give to victims of cancer. Now, my hair is up to my shoulders though sometimes I think it's more like a lion's mane than a what a person's gorgeous, silky tresses should be. Will I grow my hair and donate it again? Yes. It will probably two years again before I cut it, and I will probably go through the agony that I did in the past several months, but then I realize I've probably been blessed with this wild, thick hair for a reason: to grow it for those who don't have. I should call you Ping now! I'm really enjoying your blog! Ikaw na ang legit sa #bloggersposechallenge.